NASA is currently working on several missions and researchers at NASA also have many innovative ideas for space exploration. NASA’s breakthrough Propulsion Project is one of those brilliant ideas. One of this project’s long term goals is to move away from using rockets. The problem with rocket is not that they can’t beat gravity, it’s the amount of thrust they need to defeat Earth’s Gravity. At the Glenn Research Laboratory Ohio, work is under way to introduce new forms of space engines. One of that could really take us where rockets just simply can’t i.e. beyond our solar system. Ion Propulsion Drive is one of those engines. An ion thruster ionizes propellant by adding or removing electrons to produce ions. Most thrusters ionize propellant by electron bombardment: a high-energy electron (negative charge) collides with a propellant atom (neutral charge), releasing electrons from the propellant atom and resulting in a positively charged ion. The gas produced consists of positive ions and negative electrons in proportions that result in no over-all electric charge. This is called a plasma. Plasma has some of the properties of a gas, but it is affected by electric and magnetic fields. Common examples are lightning and the substance inside fluorescent light bulbs. This plasma produces thrust. Below in the video, you can see Ion propulsion Drive being tested, pouring out constant stream of charged particles. This propulsion engine is less powerful than a rocket but it is capable of accelerating a spacecraft almost indefinitely. This particular system is ideal for generating thrust in space. They are purely operated in space because they are very gentle. Its thrust level is low but over time it can develop much higher velocities like of chemical rockets. According to an estimate by NASA it can go as fast as 90,000 mph in space. 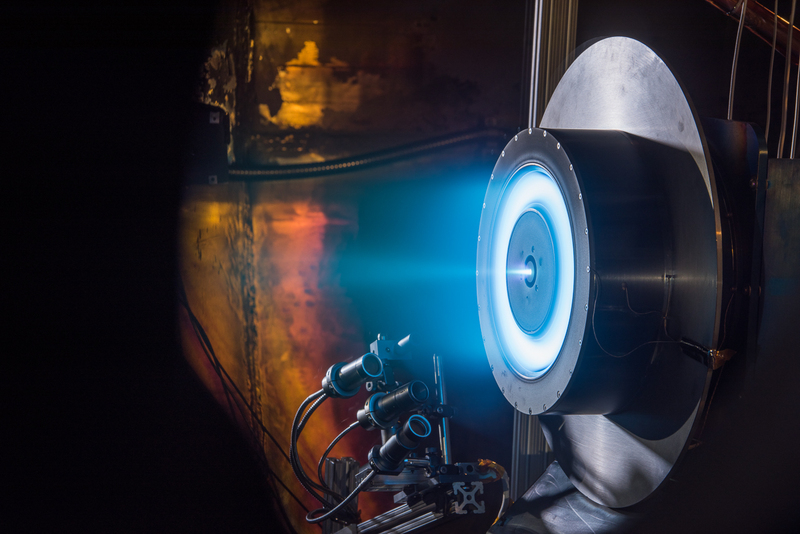 This Ion Thruster drive is not just theory or only has been tested in laboratory. NASA’s Dawn spacecraft is using the same technology.